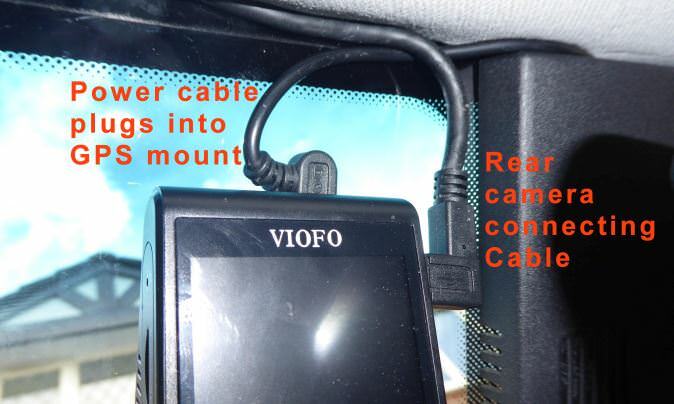 Until last week I had a VIOFO A119s V2 dash cam mounted on my windscreen and another on the rear window. I bought them 2 years ago when the camera was first launched and have been happy with them. However – time moves on and VIOFO Have now launched a new camera, the VIOFO A129 Duo which has a better Sony sensor and a new lens plus the facility to connect via WiFi to your phone. The Duo version includes a rear camera which is connected to the front one and shares the same SD card. VIOFO claim – and internet videos prove this – that the new camera has much better night vision. Being a gadget junkie I bought the new camera and have installed it in my KIA Niro. There follows a description and photos of the route I chose for the cable which connects the two cameras. This principle might also apply to other car models. 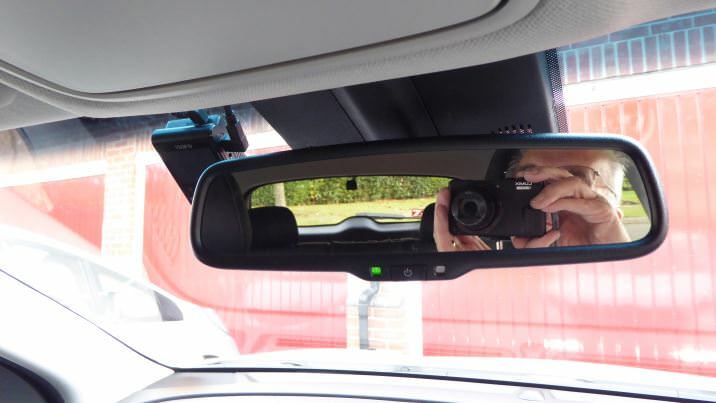 Because I wanted to avoid any intrusion into the driver’s field of vision, I mounted the camera on the passenger side – behind the rear view mirror. (I re-used the US power supply that fed the previous camera – hence the power connection was easy). 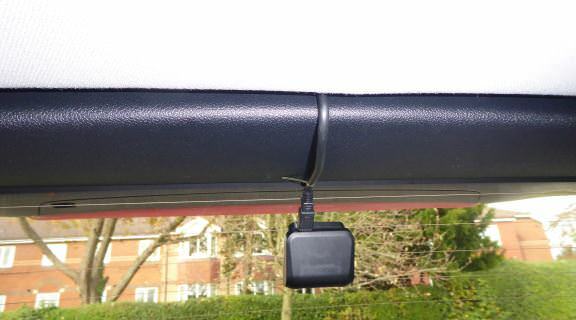 However – the A129 Duo connecting cable is much thicker than a standard USB cable and has non-standard plugs and sockets – so there is no alternative to using it. Trying to use a standard USB cable is a non-starter. 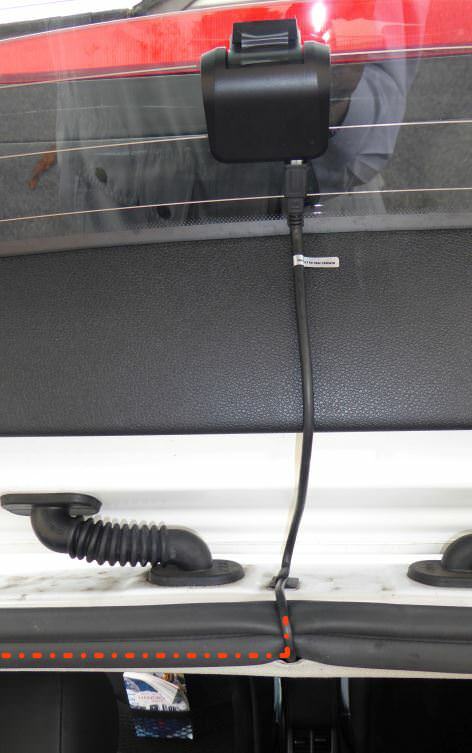 Hence, I ran this cable on the passenger side of the car, rather than the driver’s side, because there is not enough space around the A pillar to route the power and connecting cables. I ran the cable across the top of the windscreen in the gap between the screen and the roof lining, then behind the trim at the top of the A pillar (much persuasion being require around the bend) and round to the door frame rubber seal where I tucked it into the seal’s flange and ran it to the B Pillar. (The plastic trim lever tool provided with the camera was a great help). 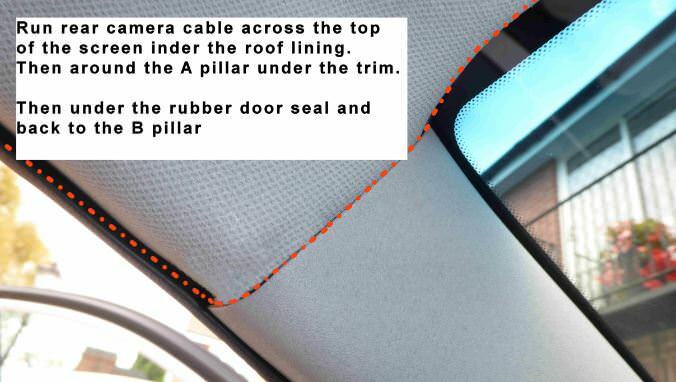 The cable can be tucked behind the B Pillar trim without too much difficulty and back into the rear rubber door frame seal flange to reach the rear pillar. On my car the provided cable is almost 2 metres longer than necessary – so before hiding it behind the rear Pillar I jumped ahead to the camera end and worked my way backwards to the rear pillar. 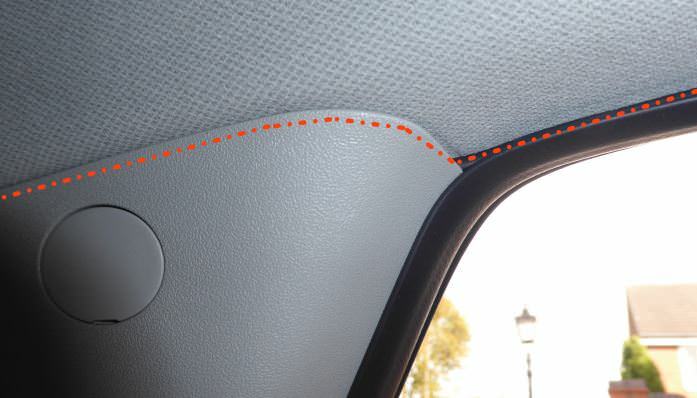 It is then easy to hide the excess cable in the rear pillar in the void behind the lining. 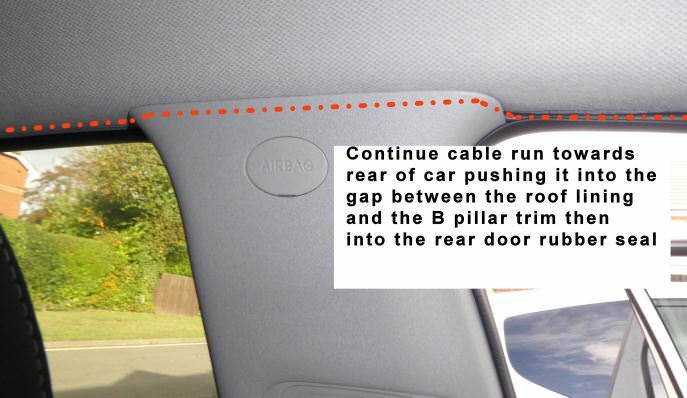 The cable then runs behind the trim at the top of the rear pillar before diving into the rear hatch rubber seal and hidden behind the roof lining. 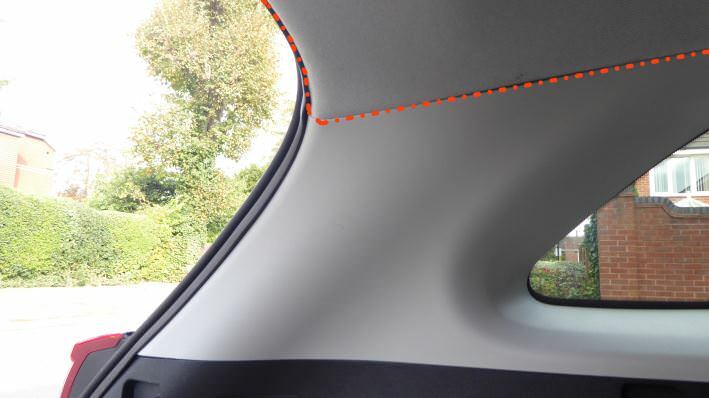 The cable runs across the rear hatch frame hidden behind the roof lining and pops out of the rubber seal at the centre, then up to the camera with a bit of slack to allow for the hatch pivoting..
Because the VIOFO cameras are a wedge shape – the lens is very close to the glass. 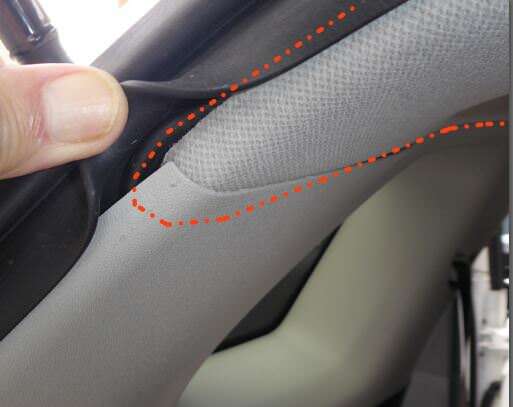 The rear camera benefits from this because it was possible to position the camera lens between the window heating elements to get a clear picture.